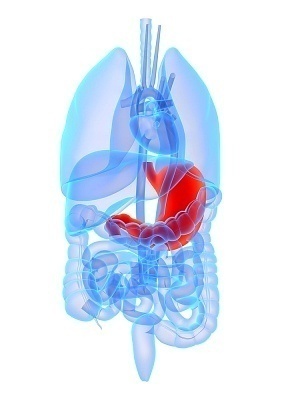 Gastroesophageal reflux disease (GERD), gastro-oesophageal reflux disease (GORD), gastric reflux disease, or acid reflux disease is defined as chronic symptoms or mucosal damage produced by the abnormal reflux in the esophagus. It is a condition in which the liquid content of the stomach regurgitates into the esophagus causing inflammation and damage to the lining. . 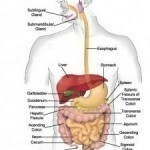 The regurgitated liquid usually contains acid and pepsin which are produced by the stomach may also contain bile that has backed-up into the stomach from the duodenum. The most-common symptoms of GERD are heartburn, regurgitation and difficulty swallowing. Heartburn is the primary symptom and it manifests as a burning sensation that travels up from the stomach to the chest and throat. Risk factors for heartburn are a heavy meal, bending over, lifting, and lying down, particularly on the back. Any injury to the lining of the esophagus results in a chronic condition. 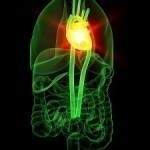 Once GERD begins it will be life-long and is usually recurring even after treatment. Once treatment for GERD is begun, therefore, it usually will need to be continued indefinitely although it is argued that in some patients with intermittent symptoms and no esophagitis, treatment can be intermittent and done only during symptomatic periods. Apple cider vinegar – studies reveal that apple cider vinegar can help to relieve the symptoms of occasional heartburn or acid reflux. There are several underlying theories as to how apple cider vinegar aids in acid reflux, but despite the variations all conclude that this natural home remedy really works. Take one tablespoon of Apple cider vinegar prior to each meal; this dose can be continued even after symptoms go away. Baking soda – the sodium bicarbonate found in baking soda acts as an acid neutralizer in the stomach and regulates the flow of acid. Use half a teaspoon to a teaspoon of baking soda to 1-3 ounces of water. Ensure the mixture is completely dissolved before drinking. Apple – the consumption of apples is one of the easiest and most natural remedies for acid reflex particularly when eaten before retiring to bed. Ginger tea – visit your nearest health food store and purchase organic ginger tea or ginger root capsules. Take before or immediately following a meal. Aloe Vera juice – the Aloe plant originates from Africa. The long, green leaves contain aloe gel and a sticky yellow residue called latex. The gel is the part of the aloe plant used most commonly, both topically and orally. Take 1/4 cup of aloe Vera juice approximately 20 minutes before a meal to help soothe an irritated esophagus. Diet – eat smaller meals, avoid spicy, carbonated and caffeinated drinks and foods, and avoid acidic foods such as grapefruit and oranges. Garlic – chew fresh garlic or juice in a drink convert the allicin (compound with antibacterial and antifungal properties) in the garlic to its active ingredient.